Are The Chinese Back at Zimbabwe's Marange Diamond Fields? On 20 April 2018, the Zimbabwe Environmental Law Association (ZELA) accompanied ambassadors from European Union countries during their field visit to the Zimbabwe Consolidated Diamond Company (ZCDC) mining operations in Marange in the east of the country. One interesting observation was the fresh fence erected on Anjin's concession, an air strip clearance and the presence of some Chinese on the ground. The personnel are clearly not ZCDC staff and indications were that they were not maintenance staff either. This raises several questions: is Anjin back? If so, in what disguise? Did they get a new license? 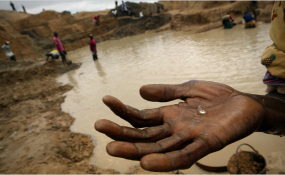 In November last year, is among the security forces that ventured into diamond mining in the controversial Marange fields. State security agency Central Intelligence Organisation held 50 percent shareholding at Kusena Mine, with the other 50 percent held by the Zimbabwe Mining Development Corporation (ZMDC), according to former director Happyton Bonyongwe's disclosure in Parliament recently. The Zimbabwe Republic Police held 20 percent shareholding in Gye Nyame, another mine in the area. The mines, along with several other ventures, were forced off the mines after government cancelled the licenses of foreign companies mining the seven concessions that make up the diamond fields. Last week, ZCDC chief executive Moris Mpofu insisted in a response to industry newswire Papaport News that there are no other companies operating in Marange. But the unaccounted presence of the Chinese at the Anjin operations is worrisome and the government owes the nation full disclosure. A colleague pointed out that the involvement of the army in business is not a unusual and that this was the norm in several countries. What matters is a strong dosage of transparency and accountability which is critical to deliver benefits to citizens and not to a few powerful individuals. To win public trust and confidence, government must move with speed to align mining legislation with Section 315 (2) (c) of the Constitution to deliver transparency and accountability in the negotiation of mining contracts as well as performance monitoring of the mining contracts. In addition, government must urgently embrace the Extractive Industry Transparency Initiative (EITI) to enable the public to track various taxes paid to government institutions by mining companies. Transparency and accountability reforms in the mining sector are a key indicator to whether government is committed to curb corruption, to abide by the Constitution and to leverage the country's abundant mineral wealth for socio-economic turnaround. Zimbabweans need a clear picture of how the new government is managing the country's mineral wealth: platinum, diamonds, lithium and gold among others. Diamonds, because of their characteristics as items of high value which are easy to carry makes the stones attractive to criminals. Money laundering risk exposure in the trade of diamonds is well articulated in the watchdog Financial Action Task Force (FATF) 2013 report. Unarguably, the army's involvement in Marange did not deliver any tangible development outcome, the $100 million defence college being the only exception. Likewise, the army gained key positions in the new government which include the offices of the vice president, minister of agriculture and minister of foreign affairs and trade. The history of Anjin's diamond mining activities is murky. From the Auditor General Mildred Chiri's 2011 report, it can be gleaned ZMDC was not committed to recover money from the proceeds of disposing 40 percent equity in Anjin to the army. In her 2016 report, Chiri said her office could not verify Anjin's diamond earnings because the company could not avail its audited books. During the peak period, diamond exports by value and volume, in 2012, the former Minister of Finance, Tendai Biti singled out Anjin for not paying taxes. Zimbabwe exported 14,957,648.98 carats worth $740,998,088.16 in 2012 according to Kimberly Process statistics. In July 2017, the private Zimbabwe Independent reported that Chinese investors syphoned $255 million from Anjin.